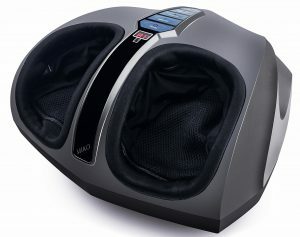 The Miko Shiatsu Foot Massager might be one of the best electric foot massagers. What caught my attention at first is that there are countless happy users out there who provides foot massage reviews of this particular Miko model. Also, I wanted to be methodical and tested it first to understand the Pros and Cons of all its features. All all my criteria and observations are right below. 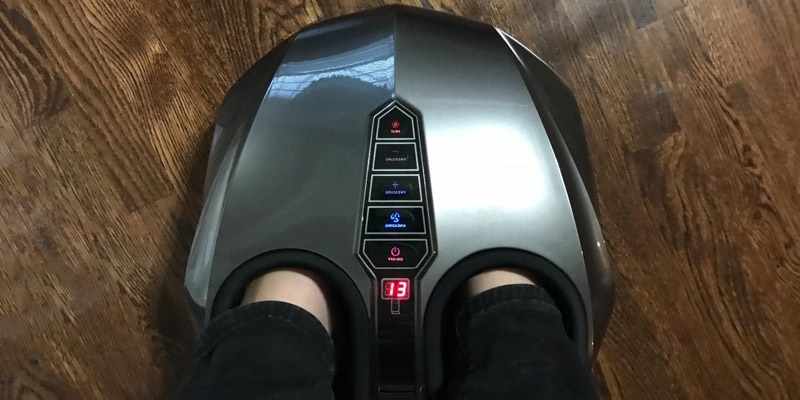 I am not just going to mindlessly praise this foot massager, I listed some common complaints below. This is an essential feature to consider when buying any sort of device. While some products that feature a learning curve are ultimately worth it because of their quality features, we always appreciate an intuitive interface. When buying a therapeutic, relaxing massager, it’s important to be able to use it right out of the box, not to get angry that you can’t program it. 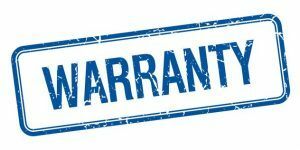 You always want a reliable product that’s safe and comes with good warranties. The Miko foot massager has them both, thanks to the auto shut-off feature and a 1-year warranty. This device has great reviews all over the World Wide Web. The customer reviews on Amazon from people with verified purchases are extremely clarifying and only highlight minor inconveniences. We tried the Miko foot massager, and we liked it. It’s easy to customize, it offers a lot of options and massage techniques, you can adjust the intensity, it has an intuitive interface, plus it’s compact and portable. 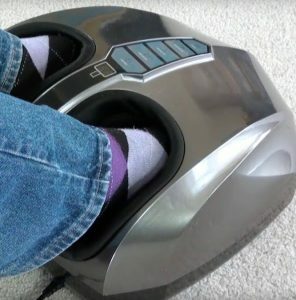 Even if it’s not the most affordable foot massager on the market, it certainly has some unique qualities that render it a therapeutic product. Besides, for this price, you could only buy yourself a few massage sessions with a chiropractor, so it’s definitely worth it. The Miko Shiatsu foot massager boasts many of the benefits of a true reflexology machine. 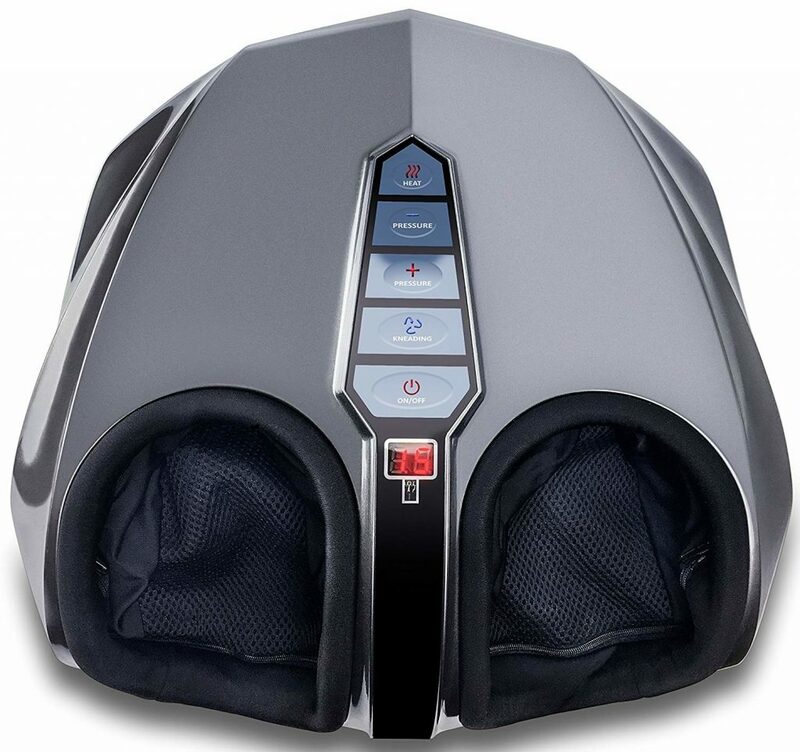 It features deep kneading technique and Shiatsu nodes that offer a true deep tissue foot massage that relieves chronic pain. Considering that it covers your feet entirely, the Miko massager unwinds your plantar fascia and massages your Achilles’ tendon in order to reduce tension and pain. That’s why the Miko massager does wonders for runners or people who practice other high-intensity sports. The air massage function is great for improving blood circulation because your feet will be successively compressed and decompressed to reduce swelling and activate the lymphatic system. This reduces the risk of heart-related problems and improves your immunity. The heat function is another benefit, unwinding sore muscles faster to relax you after a difficult day on your feet. In combination with the vibrations, the massage becomes more effective, so you can decrease stress and fall asleep faster. One of the top features of the Miko foot massager is its user-oriented design, although the instructions are quite clear. 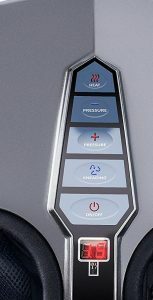 You can activate and control this massager very easily with the intuitive control panel, which has soft-touch buttons. Besides, the control panel is illuminated, meaning it’s easy to use even in a darker room. However, the control panel has you bending down, while the two included wireless remotes allow you to customize the settings while sitting. The “downside” about the remotes is their short reach, but your feet are already inside the massager, to begin with. The auto shut-off programmed at 15 minutes is a user-friendly feature. In case you forget to turn it off, the massager will stop by itself so it won’t consume a lot of power or overheat. It’s also a good idea to have a 15-minute auto shut-off because the manufacturer recommends only using it for 15 minutes each day, at level 1 intensity until you become accustomed to it. Once you’re not new to it anymore, you can just restart the program or choose another one and continue your massage session. The Miko Shiatsu home foot massager has a futuristic design, which might not be everyone’s cup of tea. However, the massager is functional, with two separated foot chambers that provide an awesome massage. I like how stable it is as well, even of shiny surfaces. That means you can use it in every room of your house and, considering its low weight; you can even take it to your office. The Miko foot massager is compact too, which wins it portability points, making it easy to store under your sofa or in a wardrobe. The Miko foot massager is low-maintenance and easy to clean. The zippered cloth cover is easy to wash, but follow the user manual in order to clean the outer shell, with warm water and a mild detergent. The Miko massager features two separated foot chambers that help massage each foot independently. This massager is intended to relieve chronic pain, and that’s why it features a deep kneading, Shiatsu massage. In combination with the vibrations and the air massage that inflate and deflate, sore muscles are almost immediately relieved. This massager also features a heat option you can turn on or off. However, this is more like a warmth than actual heat, and you can’t adjust the temperature. I also like that you can easily customize the massage you need, by selecting the type of massage you want, the intensity and whether or not you want to activate the heat. massager happens to have quality issues. The Miko customer service doesn’t attract many complaints. This is a quality brand that values its customers and aims to offer good services. Yes, but just for the first few sessions, until you become accustomed to the machine. You will find included an AC power adapter, user manual, and two wireless remotes, along with the foot massager itself. If you’re not happy with this product, you can exchange it for a new one or get your money back within 30 days. Although this massager is a bit expensive, shipping is free. There are a few common complaints among the users. For instance, even if the heat function feels like real human hands and unwinds sore muscles easily, it’s not adjustable. So some people might prefer more heat instead of just gentle warmth. Another disadvantage is that the Miko foot massager isn’t that great with targeting the heel area, especially for people with bigger feet. So remember that this product is good for up to size 12. Also, keep in mind that this isn’t a calf massager, even though that would have been a great addition. 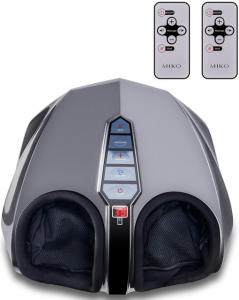 The Miko Foot Massager is a therapeutic machine that can help relieve pain and stress. It’s a great tool along your regular massage or therapy sessions, but, if you’re on a budget, Nekteck Foot Massager is the best alternative. 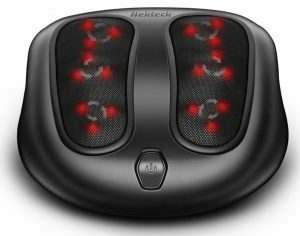 The Nekteck boasts 6 massage heads with 18 rotating massage nodes, it’s height-adjustable and offers a powerful Shiatsu massage to improve blood circulation and relieve pain. It even features heating, but the open design means you’ll get a smaller massage surface.